Saudi Arabia’s liberalization drive continues to bring surprises. 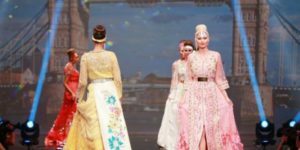 Next March, the Kingdom will organize its first fashion week. The event overturns decades of draconian policies on arts and entertainment. It comes in a series of initiatives spearheaded by all-powerful Crown Prince Mohamed bin Salman. After allowing women to drive, attend football games and opening cinema theatres, the fashion week is another indicator of a liberalization turn in Saudi policies. The Arab Fashion Week will take place at Riyadh’s eco-friendly Apex Centre, a white honeycomb-like venue designed by the late celebrated Iraqi-British architect Zaha Hadid. Recently, a top Saudi cleric said that the black dress known as Abaya was not mandatory in Islam as long as women are decently dressed. Written by: Jaber Ali on February 20, 2018. Posted by Jaber Ali on Feb 20 2018. Filed under Gulf News, Headlines. You can follow any responses to this entry through the RSS 2.0. Both comments and pings are currently closed.